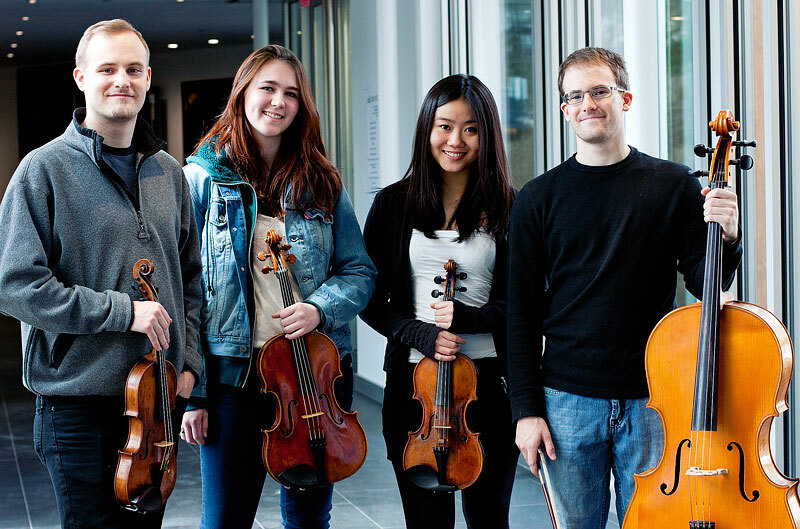 PHOTO CAPTION: Students at The Bard Conservatory of Music will be playing Mozart’s String Quartet in D major, K575, at an upcoming presentation by ClaverackLanding. The evening, with original poetry by Kate Light, is called Einstein’s Mozart: Two Geniuses – a Bard at the Landing presentation. Pictured here (from left) are Scot Moore – violin, Rosemary Nelis – viola, Reina Murooka – violin and Stanley Moore – cello. The concert takes place on Saturday, April 13 beginning at 6 pm, at the First Presbyterian Church in Hudson. Go to www.ClaverackLanding.org for tickets and information. HUDSON – In 1905, Albert Einstein published five papers and introduced his revolutionary Theory of Relativity. Almost two-hundred and fifty years earlier, Wolfgang Mozart, a genius in his own right, was born in Salzburg, a city in what is now Austria – then part of the Holy Roman Empire. In 2005, Kate Light, a librettist, lyricist and poet was commissioned by the Colorado Chamber Players to commemorate the close convergence of these two greats. The result is Einstein’s Mozart: Two Geniuses a combination of music and poetry that is being presented by ClaverackLanding on Saturday, April 13th beginning at 6 pm. The event takes place at the First Presbyterian Church on the corner of Fourth and Warren Streets in Hudson. Tickets are $20.00 each and can be obtained on-line at www.ClaverackLanding.org. Two string quartets, made up of students from the Bard Conservatory of Music will be playing works by Mozart. “This is National Poetry Month,” says ClaverackLanding’s founder, Gwen Gould. “We wanted to make sure to celebrate poetry in some way as part of our chamber music series. The opportunity to have Kate Light come and perform her own compositions is a special treat. Kate played in the Columbia Festival Orchestra for many years, but more recently, has been working extensively on original pieces. To be able to present this convergence of chamber music by Mozart and Kate’s readings is like offering the best of both worlds. Part two, featuring the String Quartet in C Major, K465 “Dissonance” brings different thinking into play. Says Moore, ”I think that Mozart was pushing his skills and intellect in order to impress Hayden, his idol. Since it is Hayden who is attributed with the invention of the string quartet, Mozart wanted to push the boundaries of the new form. Including a long dissident line is one way of stretching the definition of the string quartet.” Bard’s Jiazhi Wang- violin, Jiamin Wang – violin, David Toth – viola and Rylan Gajek-Leonard – cello will be playing this piece. Bard at the Landing: “Einstein’s Mozart: Two Geniuses begins at 6 pm on Saturday, April 13th at the First Presbyterian church in Hudson. Tickets can be purchased online at www.ClaverackLanding.org and cost $20.00 each. For more information, go to the website or call 518.828.7513. Concerts and education programs of ClaverackLanding, great music in great spaces, are supported in part by Herrington’s, Hudson River Bank & Trust Company Foundation, T. Backer Fund, JSL Computer Services, and many generous individuals and business sponsors. Celebrate Poetry Month & Two Geniuses April 13!